The question. My question this morning dealt with money and location. I need to bring in more cash in the short term. The possibilities for accomplishing that are more numerous in the city – where I’m staying – than in the country, where I live. I love my home and its close proximity to family and friends ... but a fella’s gotta make a living. What shall I do about this? Like many folks these days, I’m anxious about money – when confronting these issues, I run into a kind of confusion and muddiness regarding how to proceed. What assumptions and fears are operating unseen within me? What am I buying into? The casting. The Musician’s Die landed on Gb, pointing absolute south, which indicates the general perspective of the casting was to be about “what’s coming down” – or coming through – vertically, in terms of being. The first Solfége Die I rolled was fa, which indicates a time of transition. The card I drew underneath fa was a Minor Sixth of Woodwinds: longing or hunger in the Realm of Mind. I think of this card as the "thirst for knowledge" card – and indeed, I'm dying to know what to do at this time of transition ... I am constantly distracted. Gotta know, gotta know, gotta know. I rolled again: le, the point of mechanicality, of unconscious behavior. The card I drew above it: the Conductor of Woodwinds, a Leader in the Realm of Mind. Now, conductors, especially when operating unconsciously, can point to control issues; an unconscious Conductor of Woodwinds can indicate an attachment to being right. These first two positions together, then – the Minor Sixth of Woodwinds under fa and the Conductor of Woodwinds over le – speak of a kind of mental obsession with having things figured out. The next die I rolled was fa again, which created a double at the first position and so formed the casting's axis. The card I then drew to cross was the Orchestration Card, which I placed horizontally across the Minor Sixth. The Orchestration Card deals with delegation and managing resources – sometimes within, sometimes without. In forming the axis, the hunger of the Minor Sixth, this need to figure things out, had become bound up with deciding who's going to do what and when. Which of my many irons in the fire should take precedence? What can I hand off, and to whom? Figure figure figure, clickety click click – put all this in the hands of a Conductor obsessed with control and you've got a guy who isn't sleeping much. So what do I do with all of this? Get out of my head, certainly – but in what way? As sometimes happens, the casting has accurately telegraphed a situation and seems to suggest something, but hasn't pointed strongly to a particular course of action. When this occurs, I'll sometimes just roll and draw again, or maybe do a separate One-Up. The axis of a casting usually signals its end – sometimes, though, it just signals a pause, a time to take stock and do some interpreting before continuing on. Adding in the Tarot. The course of action I decided to take in this instance was to break out my Universal-Waite Tarot. I shuffled and pulled a card from the center of the deck, and placed it face up below Position 1: the card was The Fool. What might this card mean at a time of transition, in combination with intellectual hunger and delegating responsibility? The Fool's striking difference to the Muzoracle cards above it suggest to me a balm to all this obsessive thinking, a kind of return to innocence, a simple and childlike following of one's heart and conscience. It seems a call to lighten up – the white prancing dog on the card even looks like my Havanese! The Fool also suggests the presence of the Trickster, that this pickle I'm in is a kind of cosmic joke, which, if taken correctly, can really show me some things I'd otherwise not be able to see. I then drew another card from the middle of the deck and placed it over position 2: it was the Seven of Wands reversed. Now, last night one of the questions on Jeopardy! was "What is Pyrrhic victory?" When this card turned up, this question rang in my head. Sevens are about victory, and the Seven of Wands is about relishing the fight; but it's upside down here, and joined to an unconscious leader. The Conductor here is Pyrrhus himself: this is a battle I don't want to fight. Again, there is a call to relinquish control, to loosen this mental grip. Looking at all this, I had an intuition to cap what I had so far with a One-Up. I rolled te ascending, and drew a Major Triad of Percussion over it: Fulfillment in the Realm of Body at the point of Effort. I then drew The Emperor over that. This position was most helpful: the triad was a call to examine what I want as an endpoint in the real physical world, and also a call to ground. The Emperor I drew next indicated order, but on the terms of the Major Triad adjacent to it; an anathema to the tyranny of thought found in position 2, it spoke of kingship over a bounteous land. Musician's Notes. In the first position, the Minor Sixth built downward from fa creates an open voicing of a Major Triad: if we sound our Gb and then add below it Cb and the Eb below that, we hear an open Cb triad with an Eb at the bottom – very consonant, very rich. The second position in our casting involves just the one note D; in conjunction with our droning Gb, we hear an implied D Major Triad. The third position is a E Major Triad; the droning Gb sounds like an "add 2." This casting is extraordinarily triadic and consonant. Although its key center is Gb, the key we really feel is Cb, the key of fa, sounded at the first position. Harmonically, Cb Major is the source of Gb Major; musically, this casting is centered around the notion of returning to source, as exemplified by The Fool. The E Major Triad in position 3 lifts you right out of your boots. This casting was very healing and soothing to play. This last weekend we exhibited the Muzoracle at the New World Fair in Pasadena. It was a pretty crazy event with lots of scattered energy, especially on Saturday. I cast for a couple of people that can only be described as energy vampires: they bring all of their drama and baggage to the table, and seem hell-bent for leather on dragging you into it. One person in particular seemed just this side of the nuthouse, barely listening to what I was saying, grabbing cards and dice when he felt like it, and essentially yelling things like, "I WANT ANSWER! SHOULD I DO THIS OR NOT?! SO THIS THING DOESN'T WORK FOR FUTURE, ONLY FOR PRESENT AND PAST?! AAARGH! I TAKE OTHER CARD! I'M A VERY SPIRITUAL PERSON!" Oy, it was exhausting. By the time the day was done, I'd have rather ate from the catbox than do another casting. "I'm just the piano player, dammit!" I'm thinking. "Leave me alone!" At the day's very close I had one more casting, and it was with another intuitive reader -- and she was present, immediate, and grounded as can be. Hallelujah! She gave me some very valuable tips -- stuff I'd heard about, but had no practical experience with. Most helpful was her advice on maintaining boundaries, about not making other people's stuff yours; and also about maintaining a certain authority while casting. Yes, the authority in terms of meaning belongs to the querent – but the form and flow of the casting is my job, and it is not up for grabs. The next morning, while sitting at the booth before the show began, I cast for myself regarding the day ahead. The axis of the casting was the Soloist of Strings crossing a Perfect Fifth of Strings over the scalepoint of so: Initiative and Autonomy in the Realm of Feeling at the point of Challenge. It couldn't have been more clear: take charge of your feelings by remaining autonomous. Shortly thereafter I cast for my partner Hugh, who was also working the booth and was pretty frazzled himself. Two of the cards in his five-position spread were also Soloists: the Soloist of Woodwinds and the Soloist of Percussion. In the Muzoracle literature, the Soloist is described as " autonomous, independent, a loner, a maverick, a star". The notion of boundaries is also implied: that which is self-contained has borders. Returning to this idea as Sunday ran its course, I saw that, in terms of energy drain, it takes two to tango. Something needy in someone else wants my support; something needy in me wants to please them, and we are drawn to each other like magnets. If I wish to avoid vampires, perhaps I should show a little less neck. The scalepoint of so refers to broad challenges, to "life-lesson" kinds of challenges. The implications of the axis in my casting reach beyond the issues directly at hand, and beg deeper exploration of the Soloist within. When are our boundaries enforced, and why? When are they nonexistent, and why? What exactly is "autonomy", and what in us desires it? What is a "star", and who wants to be one? I have come across some confusion among users regarding the scalepoints of re and le, especially in their ascending aspect. What does mechanicality mean, and how does it figure into a casting? In the Muzoracle, mechanicality refers to unconscious behavior or beliefs. It speaks of what's operating within us without our intent, consent, or even knowledge: our habits, our reactions, our compulsions, our automaticity. 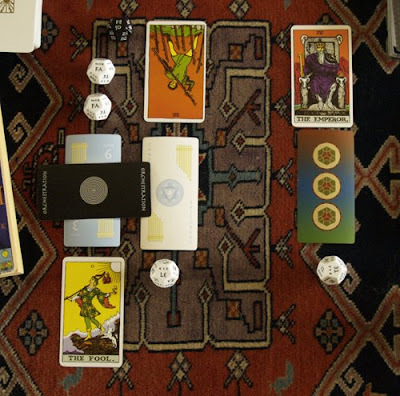 Cards drawn above re or le speak of hidden forces driving things – sometimes within us, sometimes without. Not all unconscious mechanisms are harmful. Indeed, they form as practical responses. Baby burns hand on stove; 20 years later, Baby doesn't have to think about it -- there is an unconscious mechanism that keeps its hand off the burner. If, however, Baby learns to equate abuse with love, and 20 years later finds itself in a string of abusive relationships, there may be an unconscious mechanism that needs to be addressed. When mechanicality appears in a casting, it simply speaks of things that are operating unseen; they may or may not be obstacles to what's at hand. Sometimes the appearance of a card over re or le signals something repressed and of value coming to light: yes, it's been hidden, but the fact that it's sitting in front of us on the table means it ain't hidden no more. Cards over re/le might also indicate something that needs to be brought to light. In the greater scheme of things, mechanicality looms large. Unconscious mechanisms within us give rise to behaviors, which in turn affect others, each of whom has their own set. How much of life is really one plane on autopilot bumping into another? What assumptions do we unconsciously make as a culture, or as a species? Who's driving this bus? As you may know, we've been really hustling around here at Philomuse to get Muzundrum, our new music theory game, released. I've been planning on packaging the game in a triangular box – getting someone to make a triangular box, however, has been like pulling hen's teeth. You wouldn't think so – I mean, they make all kinds of weird-shaped boxes for things. Anyway, after yet another bout this weekend with flake-outs and unanswered e-mails, it occurred to me that maybe the universe was trying to tell me something: maybe I should go with a square box with an insert, save some bucks, and keep the price point down on the final product. I decided to cast the Muzoracle and see if anything helpful came up. The above is what I cast. As you can see, the casting was an ascending one: the black Musician's Die, which I rolled first, landed pointing up. 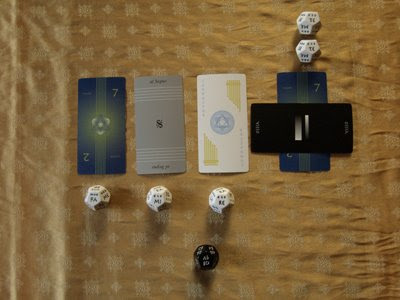 The casting, then, was to build upward, with the white Solfége Dice building up from the Musician's Die, and the cards building up from the Solfége Dice in turn. In terms of meaning, ascending castings refer generally to things we're trying to accomplish, to uphill climbs, like... like trying to get these damn boxes made. The first die I rolled was fa, which speaks of what is being revealed, what's coming to light, what's bubbling up. The card I drew above it was a Minor Seventh of Strings. Now, minor sevenths refer to retreat, return, withdrawal... or attachment. The Suit of Strings refers to the Realm of Feeling. Hmm... could some kind of emotional attachment be coming to light here? Perhaps some kind of clinginess around my precious triangle design? I rolled again. Mi, the point of "effort required." The card I then drew above it: Al Segno: "to the sign." Working with signs, looking for portent: a suspicion about all this peculiar flakiness I'd been encountering brought me to the casting in the first place. This position suggests that I might trust those suspicions, that I might "work with the signs." Next roll: re, the point of mechanicality, of unconscious behavior. The card then drawn above re: the Conductor of Woodwinds. Conductors are about leadership; they can also, however, be about control issues, or even bullying, especially when they occur at the point of unconscious behavior. The Suit of Woodwinds refers to the Realm of Mind, the intellect. This position indicates to me a kind of hardheadedness, an unseen but powerful pushiness in terms of ideas. And the next roll: te. Now, te is a chromatic point – it's not do, re, mi, fa, so, la, ti, do, in other words. That means it goes at the top of the casting, and the card we draw subsequently will go underneath it: chromatic points always travel in the opposite direction of the casting at hand. In terms of meaning, that means that this point is opposition to our upward climb: it's about what's coming down. And what is does te descending mean? Opportunity. This card's going to be about opportunities presenting themselves in the face of my difficulties. Oh boy! 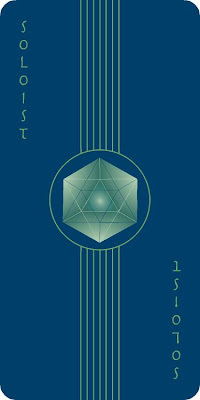 The card I draw: A Major Seventh of Strings – Lack in the Realm of Feeling. How could a lack of feeling be an opportunity? It seems kind of obvious how it could be now, but at the time I had no idea. I moved on, and rolled again. Sometimes you have to do that – just let things sit a bit and come back to them. The die I rolled next: te again. When you roll a die for a second time, it's position becomes the axis of the casting, it's center of gravity. The doubled die is placed adjacent to its mate, a card is drawn and placed across the one already there, and the casting is complete. The final position in this case, then, this point around which my story is revolving, is about opportunity in the face of adversity. The final card I drew: Ossia, the "alternate passage". Ossia under te: opportunity in taking an alternate path. A potential meaning of the card underneath Ossia, the Major Seventh of Strings, then began to emerge as well: perhaps the lack of feeling referred to could be a letting go of the emotional attachment talked about in the first position, which is also in the Suit of Strings. The axis of my casting, then, the center of gravity of my story? Emotional Emptiness and Alternative Passage at the Point of Opportunity. I decide I like this story. Letting go of my emotional attachment and hardheadedness regarding my original design, paying attention to an emerging intuition, exploring alternatives: I think I'll work with that. Now: did the oracle tell me what to do? No! I used the perspective it provided to help flesh out a creative response to my situation. Will my response bring good fortune? Dunno! Prediction, fortune telling: bad! Creativity: good!